C180-015: Rodney Charters, A.S.C. – DP on "24"
One of the hottest shows on TV for the past eight years has been Fox’s “24.” It’s verite, block picture-in-picture, and high intensity editing has become a pop culture, signature style. Today we have on the show the man that plays a huge role in the look of the show, it’s director of photography, A.S.C. 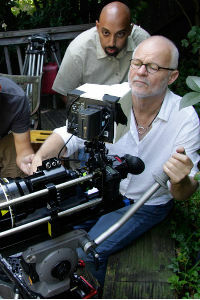 cinematographer Rodney Charters. Rodney talks about background growing up in New Zealand, the son of a photographer. He talks about the changes going on in the industry as we evolve from most TV shows finished on film to being shot on digital; he shares some of the most intriguing stories of his time as a cinematographer leading up to “24”; what it was like working on the show; his take on the HD DSLR craze; whether or not it takes a film school degree to get into the biz nowadays; and so much more. It is so inspiring hearing from such a seasoned veteran and artist talk about his craft. It’s a jam-packed hour for sure.